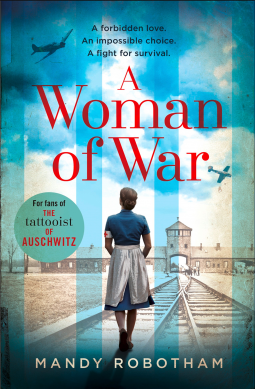 Back cover blurb: For readers of The Tattooist of Auschwitz and Kate Furnivall comes a gritty tale of courage, betrayal and love in the most unlikely of places. Germany, 1944. Taken from the camps to serve the Fuhrer himself, Anke Hoff has been assigned as midwife to one of Hitler’s inner circle. If she refuses, her family will die. Torn between her duty as a caregiver and her hatred for the regime she’s now a part of, Anke is quickly swept into a life unlike anything she’s ever known – and she discovers that many of those at the Berghof are just as trapped as she is. Soon, she’s falling for a man who will make her world more complicated still. Before long, the couple is faced with an impossible choice – for which the consequences could be deadly. Can their forbidden love survive the horrors of war – and, more importantly, will they? What would you do given the choice of life or death? If you were forced to live in hell like freezing conditions full of pain and suffering and had a choice to get out back out into the real world, but that world is being run by a murderous mad man. Anke Hoff is a respected and experienced midwife, when she is forced to make a choice for the sake of her family. She has been summoned by the fuhrer for her experience to attend to one of his inner circle, as their midwife. If she refuses then her life in camp will surely become worse, she may be killed, her family certainly will die. Anke puts her family first and soon finds herself amongst unimaginable luxury at the Berghof. The pregnant member of Hitlers inner circle is not who Anke was expecting it to be, and she almost instantly wishes that she could leave. Being in the house itself is bad enough. But being that close to someone she despises is almost too much. But Anke is a good woman, and despite her reservations she begins to form a reluctant friendship with the expectant Mother. A friendship she never expected. But there are a lot of things that Anke doesn't expect to experience at the Berghof, particularly love. But Anke’s love comes at a high price. It is dangerous, forbidden, and could be deadly. A Woman of War is a beautifully written historical novel, that is set to become a firm favourite. A Woman of War is available now via Amazon online and all good book shops.